and productive on the go—without getting weighed down. Starting at just 1.5 kg, the durable HP EliteBook 2540p is HP’s smallest and lightest EliteBook, designed for maximum portability and uncompromised performance. • A compact, lightweight industrial design with a 30,7 cm (12.1") diagonal LED display. The notebook features a brushed aluminum display enclosure with a platinum-colored finish. Starting at only 1.5 kg, this notebook won’t weigh you down. • Flexible performance options. A standard voltage processor enables maximum performance, while the low voltage provides flexibility of adding an optical drive or a secondary hard drive. • Travel confidently with the magnesium-alloy casing, hardened-steel pin axels and scratch-resistant HP DuraFinish. • Centrally manage security policy with the latest HP ProtectTools mobile PC security infrastructure solution. 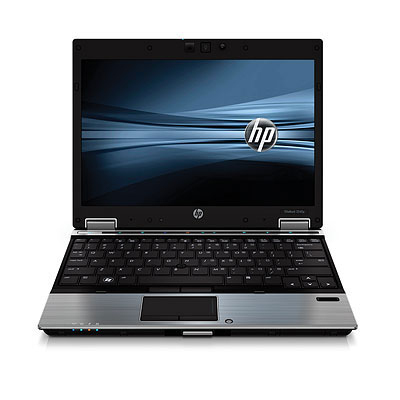 The HP EliteBook 2540p also includes optional vPro out of band management. • HP is committed to protecting the environment. The HP EliteBook 2540p is made with a minimum of 12% recycled plastic. WWAN requires separately purchased service contract. Check with provider for availability and coverage in your area. Testing was not intended to demonstrate fitness for DOD contracts requirements or for military use. Test results are not a guarantee of future performance under these test conditions.